A new genre of music has been birthed, Bible Belt Blues, with its hauntingly beautiful early Mississippi Delta Bentonia blues style wrapped around bold, biblically sound lyrics. Not your typical Christian lyrics. A sermon in a song. We are Bible Belt Blues! Original Bentonia blues influenced music with bold biblically sound lyrics. Our mission is to bring the message of hope, repentance, salvation, and revival to the nations through our music. The journey began two and a half years ago on April 17, 2016 when my husband, Harold created his very first Christian Blues song, “Taking Back the Blues.” My gut told me he was onto something and I was right! Researching the Christian Blues genre I found to my amazement that it was so rare a genre that it wasn’t even listed as a sub-genre of music! Researching even further I discovered that almost everyone who had created Christian Blues abandoned it altogether after only producing one or two songs! But why? Much to my disappointment, my husband, Harold, followed suit along with all the rest! Could it be that they had bought into the lie that blues music was the devil’s music? After all, the story about Robert Johnson selling his soul to the devil at the Crossroads of Hwy 49 and Hwy 61 had been fabricated, I would soon discover after further research. Could it be that churches were not open to allowing this music to be played in their church? Could radio stations not have known what station to play in on since it wasn’t even listed as a sub-genre? Despite my husband’s decision to abandon the creation of Christian blues music, I proceeded forward full speed ahead with my research. I ordered several books on the history of the blues, purchased early recordings and diligently studied them. I encouraged my husband, Harold, to watch numerous documentaries on the history of the blues with me and we would also listen to hours of the early Mississippi Delta blues recordings on YouTube. I would hear a certain sound and say to Harold, “Wow! I like that sound! Can we replicate that?” I encouraged my husband to learn the harmonica (which I think is key to preserving the history of the blues) and to my delight, after months of online classes, he has become an excellent player! Purely by accident, I stumbled upon the early Bentonia blues school of music (Skip James, RL Burnside, and Jimmy “Duck” Holmes, etc) which originated from Bentonia, Mississippi on the outskirts of the Mississippi Delta. Their gritty guitar picking style and hauntingly beautiful minor D and E chords totally mesmerized me. I just knew in my heart of hearts that this sound would lend itself perfectly as the backdrop music for repentance songs that were so lacking in the church these days! I couldn’t contain my excitement upon further research that no one yet that I had discovered was creating Bentonia style Christian blues music! To my utter amazement, we were creating our very own genre of music! This was beyond my wildest imagination! At that very moment Bible Belt Blues was officially born! Thank you, Jesus! What happened next is so remarkable that there is no other way to explain it except that it was a God thing. A talent I had for lyric writing that had been sitting dormant for over 40 years suddenly blossomed! I somehow persuaded my husband to let me write the lyrics first then have him craft the music around the lyrics. This was something new for him since he had originally crafted the music first then added the lyrics. The lyrics started flowing, bold, biblically sound lyrics like I had never heard before in a church or on Christian radio. I sought to capture deep theological truths that people struggle with understanding and put it in a song where people actually get it. A sermon in a song! The first day I had written three lyrics while he was at work! I was writing repentance songs, invitation songs, prayer songs, revival songs, and closing songs. I even wrote a song to promote celibacy before marriage and another for suicide prevention. After the creation of the lyrics we would sit up till the wee hours of the morning crafting the music. We always prayed before our recording sessions and invited the Holy Spirit of God to take over. Sometimes the music came out totally different than we had imagined! After we came into agreement on an arrangement for the song, Harold would record several versions of the song and I would choose the best arrangement. Since Harold is quite the computer geek, he mixed down each song and then mastered it. In a seven week period (from Sept. 3rd- Oct. 20th 2018) we had recorded 20 songs! 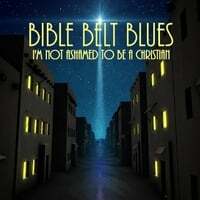 Our very first album for Bible Belt Blues, “I’m Not Ashamed To Be A Christian” (for which I designed the album cover) includes twelve of these twenty songs and was released on CD Baby for international distribution on Jan. 5, 2019. We are already working on our second album which is scheduled to be released in the early spring of 2019. My husband’s talent as a guitarist, songwriter, singer, and now as a harmonica player has grown tremendously since we married three years ago after having first met on Christian Mingle on Christmas Day of 2014. This is the happiest and most productive time of our lives producing Christian music together as a couple. God has blessed us beyond measure with the birthing of a brand new genre of music, Bible Belt Blues, with bold, biblically sound lyrics that glorify God. All songs were recorded with instruments tuned to the healing frequency of 444Hz (the Key of David). We fervently pray that our Bible Belt Blues music will be a catalyst for revival in America and around the world as it softens the hardened hearts of those who are lost to further build Christ’s Kingdom! We are humbled and honored to bring this music to today’s generation that so desperately needs God in their lives! All glory and honor go to our risen Savior, Jesus Christ. With riveting lyrics wrapped in bold Bentonia blues style music, Bible Belt Blues' ninth song release, "Seeker Of My Very Soul," challenges its listeners who are living life on their own terms without God to fully surrender to the "Creator of the Universe!" One of my very favorites! Bible Belt Blues' eleventh song release, "Soften My Hardened Heart," is an actual prayer to prepare the listener to receive their Salvation through total surrender to Jesus Christ. I wrote this song to be used in churches as an Invitation Song. We pray that the Holy Spirit of God uses this song in a mighty way! With upbeat lyrics and a surprising harmonica solo, Bible Belt Blues' eighth song release, "Into The Arms of Jesus," illustrates the process of sanctification for a Christian as we become molded and shaped into the image of Christ. What words of encouragement would you give to someone who is on the brink of suicide? Bible Belt Blues' first song release, "God's Not Through With You," addresses this question with sympathetic yet powerful lyrics that could potentially be life-saving for someone who is seriously depressed. Share a Song! Save a Life! With bold, unforgettable lyrics enveloped in Bentonia blues style music mixed with a little 70's retro, "I Didn't Take Time To Pray" is both hauntingly beautiful and confrontational for those who struggle with making the time for daily prayer. Bible Belt Blues' seventh song release,"I'm Not Ashamed To Be A Christian," encourages Christians to live our lives with boldness in sharing our faith and unwavering allegiance to our Lord and Savior, Jesus Christ, who saved us from the penalty of our sin. Bible Belt Blues' song, "A Life That Glorifies You," captivates its audience with its early Bentonia blues Skip James style and lyrics that are not your typical worship lyrics! A "Sermon in a Song." Our second song release for Bible Belt Blues takes a strong stand to promote celibacy before marriage! It's a catchy tune with upbeat lyrics spoken from a parent figure to a young lady to wait until her wedding day! Our third song release for Bible Belt Blues, "The Glory Belongs To You, Lord," is both remorseful and reverential. Harold plays the harmonica in this song and he even makes it weep! With upbeat sing-a-long lyrics, Bible Belt Blues' thirteenth song release, "Through Christ Who Strengthens Me" explores the Biblical truth that we can only find joy in the midst of all our suffering through Christ who strengthens us! Riveting, remorseful, and reverential is how I would describe our latest Bible Belt Blues song,"It's Not About Me," which chronicles the story of a self-absorbed person coming face to face with the power, glory, and majesty of God! One of my favorites!